Classical Net Review - Bach - Violin Concertos, etc. Partita #2 in D minor, BWV 1004: "Chaconne"
After finding myself unimpressed with Joshua Bell's heavily praised Four Seasons on the same label, I'm happy to report that the (still) young violinist is in top form. It's somewhat sobering to realize that as long as he's been around, we tend to forget that he's still growing and evolving as an artist. This is his first Bach album, and he was probably right to wait. As well as he plays, this album has some serious issues, but we'll get to those later. First, the good news. Bell – like so many of his fellow violinists – combines modern scholarship with good old fashioned hardball in this release. Tempos are fast, very much so, but happily not to the point where they snap off the end of every singing line. I vividly remember being blown away by the technical prowess of Hillary Hahn's early DG release, only to later lament that everything was almost inhumane in its icy perfection. 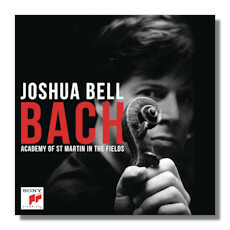 Bach needs warmth, regardless of how the period crazies portray it, and Bell has that in abundance. He also plays wonderfully. Both slow movements are incredibly well phrased, with a real sense of joy that is often missing from modern Bach. I've come to appreciate Bell's gifts more as he (and I) have aged, and his obvious love of the music is so abundant that you can't help but enjoy. The continuo line is present, but never overbearing, and frankly that's the way it should be. Both concertos fly by, but you'll probably want to listen again. The couplings are problematic. Along with the packaging, they make the whole endeavor seem so commercial. Why simply name pieces "Chaconne" and "Air"? These aren't new minimalist pieces, these are movements from some of the greatest works ever written, and deserve to be notated as such. Besides, even if this is aimed at a beginner or non-specialist audience, arguably that's even more reason to correctly identify works. In doing so, you have the chance to expose Bach to a whole new generation. I'm not sure I would have done it this way, because – naming issues aside – the fact is that the works following the concertos are also heavily Romantic arrangements. Why not just have the original works for solo violin, and the "Air" as an encore? My friends at church can play the Chaconne; I want to hear Bell do the same, regardless of how interesting the Mendelssohn arrangement may be. The Air on the G Stringis fluff no matter what you call it, and surely this 50 minute program could have used something more substantial? Finally, the Gavotteis much like the Chaconne, interesting while leaving us puzzled as to why the original wasn't chosen. Bell correctly points out that Mendelssohn played a pivotal role in the Bach revival, but his tinkering (and Robert Schumann's later) may or may not please. Still, fans of the artist will want this, and justly so. It's a very fine album for the concertos alone How much enjoyment the couplings will give is something that I suppose will be a matter of personal taste. Purists, beware!